EB/Streymur had gone to Finland with a defensive display in mind and that seemed to be the right tactics for EB/Sreymur's European debut. Although MyPa had the majority of possession, they created few clear-cut chances, but mostly half chances. 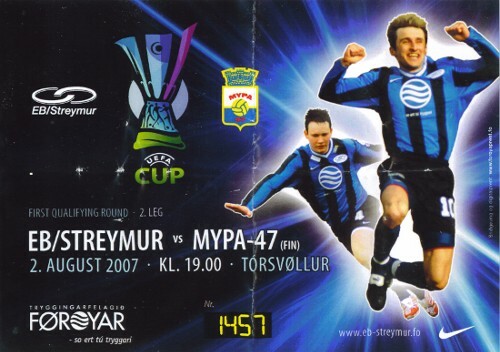 EB/Streymur held firm for 75 minutes, when Mikko Hyyrynen finally broke the deadlock with an acrobatic goal for Mypa. EB/Streymur had a few counter-attacks, but half-chances is probably the best we can call EB/Streymur's scoring opportunities. But with just a single goal in deficit, EB/Streymur is not out of it yet. The 2nd leg will be played on Thursday 02 August, on Tórsvøllur Stadium, Tórshavn. B36 Tórshavn's chances of progressing to the next round must be considered very slim after losing 1-3 to Ekranas from Lithuania. B36 will have to score at least 3 goals on away soil. That's more or less an impossible mission. Povilas Luksys made it 1-0 to Ekranas after 13 minutes when he took advantage of some poor B36 defending. But Ingi Højsted evened the score for B36 after 40 minutes with a well placed shot after Bergur Midjord had set him up. But before half time, actually 2 minutes into first half's stoppage-time, Ekranas restored their lead when Gediminas Paulauskas headed the ball into the net after bad marking in B36's penalty area. 20 minutes into the 2nd half, confusion in B36's defense allowed Serghei Pogreban through on goal and he had the easiest of tasks making it 3-1 for Ekranas. B36 had also appealed for a penalty in the first half after a reckless challenge on Hanus Tjhorleifsson, but the referee was of another opinion that time. With 2 goals in deficit, and having conceded 3 at home, B36's chances of progress are close to non-existing. The 2nd leg takes place in Lithuania on Thursday, 02 August. Both teams opened the match very cautiously. EB/Streymur's tactics was clearly to keep a clean sheet, because if MyPa scored the all important away goal, EB/Streymur would have to score 3 times in order to go through. EB/Streymur created no clear-cut scoring opportunities throughout the first half, but a few times they managed to put some pressure on the MyPa goal after corners and other setpieces. MyPa also seemed to be satisfied with 0-0, which would see them through to the next round. But after 25 minutes, MyPa were getting more forward and started to threaten EB/Streymur's goal. And around the half hour mark, they nearly took the lead when a long ball was played into the penalty area between the passive defenders, and to the Finnish player, who from a clear position hammered the ball on the right post before another Finnish player put the rebound well over the crossbar. – A very lucky escape for EB/Streymur. All in all, the first half had been a very even one with little action in front of the two goals. But the second half brought action in front of both goals right from the start. After just a minute, MyPa's Toumas Kuparinen drilled a low powerful shot against goal from long range, but René Tórgarð in the EB/Streymur goal dived to save the ball at his left post. A couple of minutes later, EB/Streymur got the best chance in the world to take the lead when they were awarded a penalty. A long ball was played into MyPa's penalty area to Hans Pauli Samuelsen who lost possession of the ball, but as he fought to get it back, he collided with the Finnish defender and went down. The referee immediately pointed to the spot. But to be fair, it looked a very cheap penalty as it seemed like it was EB/Streymur's player who had just crashed into the chest of the Finnish defender who did nothing wrong. But maybe justice was done when Ronnie Samuelsen's very poor taken penalty was saved by MyPa's goalkeeper. Ronnie tried to feint the goalkeeper by stopping/slowing down about 3 times as he approached the ball, but in the end he only feinted himself! EB/Streymur kept the pressure on MyPa for the next 5 minutes and created, if not direct chances, then at least some anxious moments in MyPa's penalty area, especially with the corners, but then MyPa slowly took over again and started to put some pressure on EB/Streymur's goal. One shot was curled towards the top right corner, but goalkeeper René Tórgarð stretched to keep the ball put of the net. A bit later, a free kick was allowed to go through EB/Streymur´s defense, but again the goalkeeper was on mark to avert the danger. But 25 minutes into the second half, EB/Streymur's goalkeeper was caught off guard when Toumas Kuparinen fired a shot from long range, and although the shot was more or less right on the keeper, he seemed to have been wrong-footed by the (perhaps unexpected) shot and couldn't prevent the ball from going in. With the away goal against them, the task for EB/Streymur was now impossible, and for the next 10-15 minutes, EB/Streymur looked a dejected side. But for the last 5-10 minutes, EB/Streymur rallied again, and this also produced them the equalizing goal. - Hanus Eliasen, who had come on late in the second half, received the ball on the edge of the penalty area on the right hand side and he brilliantly escaped two defenders before he crossed the ball in front of goal where EB/Streymur's new Hungarian forward, Károly Potemkin, who had also come on late in the second half, stretched acrobatically and got a foot on the ball high in the air and steered it in the top left corner. And EB/Streymur so nearly won the game in stoppage time when Hanus Eliasen's header from close range went just centimeters wide of the top left corner once again. But the match ended 1-1, but we can only speculate what could have happened if EB/Streymur would have scored on their penalty early in the second half.